I remember when I was ready to move on from my tiny one bedroom apartment and buy a house. It was an exciting time, as I was imagining the extra space, the ability to design it the way I wanted, and being able to build equity. But as excited as I was, I was still nervous. I never bought a house before and the home buying process is intimidating, especially for first time home buyers. Nevertheless, I worked hard at keeping my emotions in check and was able to buy my first house. During this process, I made a handful of mistakes and learned a lot. All this helped me when it came time to buy my next house. So today, I am going to share with you my checklist of 13 tips you need to make the home buying process a treat and not something to stress over. The information here is perfect for first-time home buyers as well as those looking to buy their next property. The most important step in the home buying process is knowing how much you can afford to spend. The problem with this question is that it can be tough and even confusing to answer. For example, many lenders use the 28/36 rule. 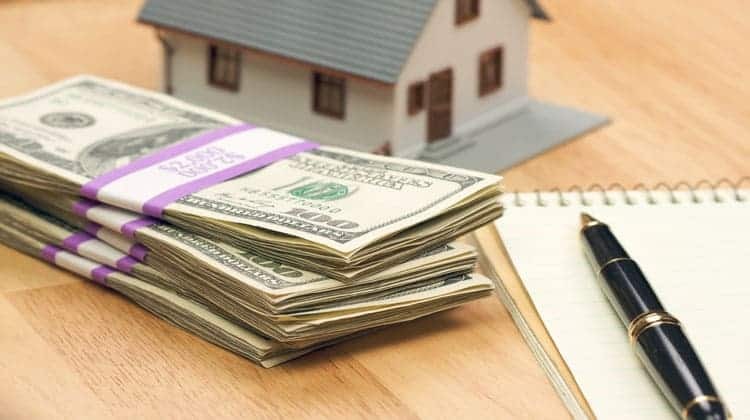 This states that your mortgage payment should total no more than 28% of your gross monthly income and your total debts should not total more than 36% of your monthly gross income. While this rule makes it sound simple to know how much house you can afford, there is an issue with it. It is taking into account your gross monthly income. This varies drastically from your net or take-home income. After you factor in retirement savings, health insurance and income taxes, you could be seeing a much lower amount in your bank account. This is where I went wrong. I followed this rule. Then I realized that I was earning a lot less when it came to my take home pay. I could have stopped my retirement savings completely, but I didn’t want to work my entire life, so that wasn’t an option for me. I ended up living off of peanut butter and jelly sandwiches and using other tricks to save money so I could survive each month. While the above rule can be misleading, you also have to take into account how much money you can put towards your down payment. This too will affect how much of a house you can afford. Ideally, you want to put down 20% or more so you can avoid PMI, or private mortgage insurance. Doing so will help to you to keep your monthly mortgage payment under control. The bottom line when it comes to knowing how much house you can afford is to do the math. To make this easier, here is a calculator to help estimate a USDA Loan Payment I found. It makes this part of the home buying process simple and does a nice job of explaining things. Unless you are paying for your house in cash, you are going to be borrowing money. The interest rate you are charged will have an impact on the amount you can borrow in total. The good news is that there are things you can do to make sure you are charged the lowest interest rate possible. The first thing you should do is make sure your credit is in good health. The higher your credit score, the less you pay in interest. Take the time to see where your credit score ranks now, and then start to work on improving it. Ideally, you want a score above 725. How do you easily increase your credit score? The simplest way is to pay your bills on time. By making sure you pay your bills on time, your credit score will increase in time. From there you want to make sure you don’t have too much debt. The less debt you have, the higher your credit score and the more home you can potentially afford. I’ll go into more detail about debt shortly. Buying a home is a big deal and you have to provide a lot of financial documents to the bank and the lender. They will pour over these documents to make sure you are a good, safe candidate for a loan. If they see wild spending habits or questionable activities, they may flag it. For example, when I was buying my house, I had a large deposit in my bank account. They questioned this and it turned out I forgot to show them a pay stub of a large bonus I earned at work. The bottom line is avoid making any large purchases until you sign on the line and own the house. This is the only way to ensure the deal not falling through. Why wait until you close and not when an agreement is made? The bank will recheck your accounts prior to closing. I know of a friend whose loan almost fell through. She was approved for a loan and two weeks before closing on her new house, she opened a new credit card to buy $5,000 worth of furniture. The bank saw this, flagged her account and was about to deny her the loan. Luckily, she was able to get them to approve it in the end. As I mentioned earlier, paying off your debts is huge when it comes to the home buying process. Not only will it improve your credit score, but it will free up money too. If you are paying $500 in credit card payments and pay off the debt, you now have an additional $500 a month. You could use this money to pay extra on your mortgage or even to save in an emergency fund. Set up a plan and make it a point to start paying off as much debt as possible. If you have a lot of debt, you might consider focusing on the two smallest balance debts and trying to pay them off. After all, any money you can free up is helpful and doing this will at least free up a little extra money. Having an emergency fund is a critical part of personal finance. You never know when something is going to go wrong and you need money fast. And having an emergency fund when owning a home is even more critical, simply because there are that many more things that can break. Sadly, the majority of people lack an emergency fund. Don’t fall into this group and start building an emergency fund. Right now, open a savings account and transfer $10 into it. Then make it a point to transfer $20 a month into this account going forward. Even though it doesn’t sound like much, having anything in an emergency fund will benefit you. And if you want help building your emergency fund faster, look into CIT Bank. They offer one of the highest interest rates in the country, which means your money is going to grow faster. Click here to open your free account. Now that you have your finances covered, it is time to turn to other parts of the home buying process. One often overlooked part is knowing what you want in a home. To solve this, you need to make a list. Here is why making a list is important. When you first begin the home buying process, you will have an idea of some of the features and things you want in a home. As you look at homes, you will see new things you want and may forget about other things. By making a list, you can ensure that you remember everything you want. But there is another reason why a list is so important. You will fall in love with things you see and want, but don’t need. By having a list, you can break it down into wants and needs. For example, I wanted a house with a garage. I like to work on my car, so having a space safe from the weather was important to me. I also wanted a pool. I wanted to host awesome parties in the summer. But at the end of the day, the pool was a want and not a need. I would be happy in a house with a garage and not a pool, but probably not happy if I had a pool and not a garage. Take a few minutes to create a list and then organize it into wants and needs to help you stay focused. In order to find the house you want, you are going to need to find the right real estate agent. Realize I am telling you to find the right agent, not the best agent. Just because an agent claims they get the best price or sells the most homes, it doesn’t make them the right agent. The right agent is someone who listens to your wants and needs and understands you. They have the qualities you are looking for in a relationship because this is a relationship. If you need to be updated constantly on where things stand and pick an agent who isn’t great at calling you back, you are going to quickly get frustrated. Take your time to interview 3 or 4 real estate agents. You can ask friends and family for referrals as a starting point. Thanks to the internet, you can easily find homes for sale yourself. This isn’t to say you should skip hiring a real estate agent. You need the agent to see properties and work as your partner to make the best decision and get the best price. But you both can scout out potential properties to ensure nothing gets missed. The added benefit to this is that your agent will get a better sense of what exactly you are looking for in the process. As you start looking at properties, you are going to get confused as to the features one has versus the others. This might not happen right away, but once you look at 5 or more houses, the details get fuzzy. The simple solution is to take notes as you walk through the house and even take a few pictures of the features you really like and dislike. This will help you to make a better decision when it comes time to narrow the list down and ultimately make a decision. If you find a house you are interested in, make sure you visit it during various times of day and during the week. This will help you to get a better idea of real life when living there. For example, I didn’t drive to my first house during rush hour. Had I done so, I may not have bought it. The main road was a traffic jam every afternoon from 4pm to 6pm. Also, after buying I learned the owners of a house near me loved throwing loud parties every weekend. Again, this information would have been nice to know beforehand. But it doesn’t end there. Here are a few more things to consider. What is the area like during a rain storm? Does the property flood? Do neighboring properties have runoff into your yard? What is the area like at night? Is it well lit? Is there any shady activity that goes on? Finally, you can talk to the neighbors as well. Asking them questions about the neighborhood not only gives you a better idea of life there, but also as to the friendliness of your new potential neighbors. I can’t stress the importance of sticking to your budget. As you look at homes, you will be tempted to move up the price range to get more features or updated floorplans. This isn’t an issue if you can afford it, but most people can’t. They end up buying a home they can’t afford and then ruin their finances in the process. If you find you really want a more expensive house, put the home buying process on hold and save more money for a down payment so you can comfortably afford it. Don’t just buy the house and hope that you get a massive raise at work or win the lottery. If you do this, you are setting yourself up for financial ruin. Alternatively, you can opt for a duplex or a triplex. Many people look for a condo, townhouse, or a single family home, but overlook the many benefits of a duplex. When you buy a duplex, you live in one side and rent out the other. In many cases the rent you collect will offset a portion or all of your monthly mortgage payment. Even if becoming a landlord isn’t on your bucket list, this option has many benefits making the process easier. For example, since you are living next door, it will be easier to keep check of the rental and collect the rent. Finally, you need to negotiate the price of the home. Unless the market is a sellers market where homes sell in a few days, you should be able to get a lower price than advertised. There are many factors that go into how much lower of an offer you should put in, so be sure to work with your real estate agent on this. But at the end of the day, go with your gut. Just because the agent is a professional, it doesn’t make them perfect. For example, our agent wanted to list our house for a lower number when it was time for us to sell. We stood our ground and listed it $15,000 higher and agreed to lower it quickly if nothing materialized. We ended up getting an offer and agreeing on a price that was higher than what she wanted to list the house at. The bottom line is to work with your agent, but ultimately the final decision is yours. Once you have your offer accepted, your work is not done. It is now time to start thinking about packing up your current residence. The thing that helped me the most was starting early. I didn’t necessarily pack everything up right away, but I did go through everything and cleaned house. I seriously considered what I needed and used and I was open to selling, donating or trashing everything else. The reason is simple. The less stuff you have, the less you have to pack, then unpack and find a new home for. Once I decluttered, then I began the process of packing. My strategy was to pack everything I rarely used or the things that were out of season before working my way towards my most used things. This helped me to avoid major stress when moving. Also, I made sure to label every box. But I didn’t just put a generic label on the box. I detailed what was in the box. For example, I didn’t write “living room” on the box. I wrote “living room – pictures, candles, pillows”. This made the unpacking process easier because I could focus on the boxes that had the items I really needed and I could take my time with the rest. There are 13 tips to start the home buying process. I’ve moved 3 times and none of my moves have been simple. They all had their issues, but I started using the tips I outlined above during my second home purchase and it made a world of difference. I was better able to remember the features of the homes I visited as well as the things I liked and disliked. It also helped me to stick to my budget and get the house with the features that mattered most to me. If you are in the market to buy a house, I encourage you to use the tips I outlined during your home buying process. I am certain they will help you make a smarter decision in the end.